The Medical Services Department at the Integrated Center for Child Development offers a comprehensive medical approach to special needs. Dr. Susan Manea, our Medical Director, is a Board certified pediatrician and pediatric neurogeneticist specializing in the diagnosis and treatment of children with Autism Spectrum Disorders, as well as genetic, neurologic, and developmental disabilities. 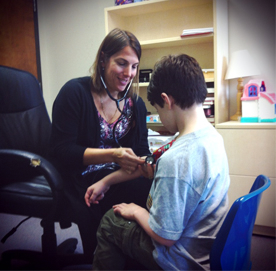 Our medical department provides a variety of services including diagnostics and treatment for a variety of genetic and developmental disabilities as well as comprehensive evaluations for Autism Spectrum Disorders. A full neurodevelopmental evaluation will define possible underlying medical etiologies and determine appropriate laboratory studies and evaluations. Comprehensive medical care includes extensive recommendations for treatment and educational programming that can be utilized to advocate for therapeutic needs. Follow-up care will address specific patient needs in the realm of behavior, sleep, nutrition, and general health with monitoring of developmental progress and continued recommendations for educational programming and home-based interventions. Psychopharmacologic modalities can be utilized as needed in patients whose family function is significantly altered and in children whose developmental progress or well being is impacted heavily by behaviors. A number of strategies are utilized to address these behaviors including ruling out underlying medical etiologies such as seizures or gastrointestinal symptoms, outlining behavioral strategies, maximizing educational programming, and helping families establish home-based strategies. Once these strategies are in place, pharmacologic agents then can be considered if the patient’s overall function does not improve. The number of medications and options that are available to families can be overwhelming; Dr. Manea feels it is important to take time to talk with families, observe children, and target specific aspects of behavior that may benefit from psychopharmacologic intervention. More importantly when prescribing medications open lines of communication and accessibility must be established to prevent untoward effects and determine efficacy. Medicine today has evolved into multiple doctors managing specific aspects of a patient’s care. In children with special needs and disabilities, it only makes sense to look at the child and family as a whole as each system impacts all others. In understanding the whole child and their family, one can provide more comprehensive care that better suits the needs of the child and the family.